It happens that every so often -- just often enough to keep me on my toes -- I come across a recipe that challenges me, intrigues me, and overall becomes the culinary bee in my bonnet, grabbing my attention and holding it tight until I've figured out just how the recipe in question should be made. 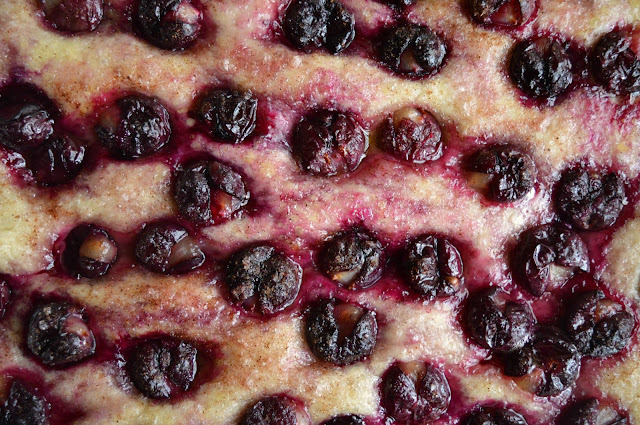 This can occur when I'm working on a recipe that I've developed myself -- an idea that I know has potential, but takes some testing, tweaking, and trial runs -- or with a recipe that's new to me, never made before, standing firmly in uncharted recipe territory, as is the case of today's schiacciata con l'uva. 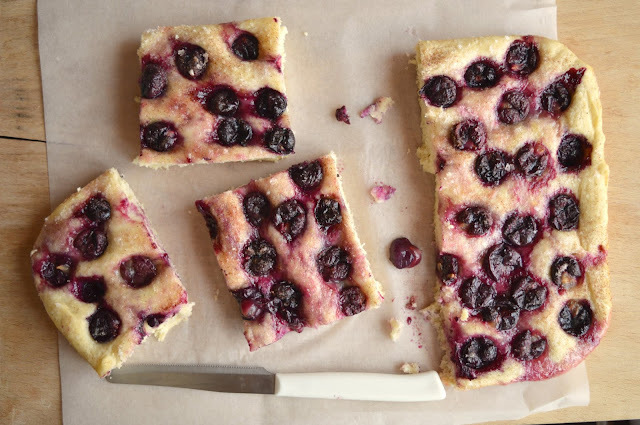 First things first -- what is schiacciata con l'uva, you may be wondering?! 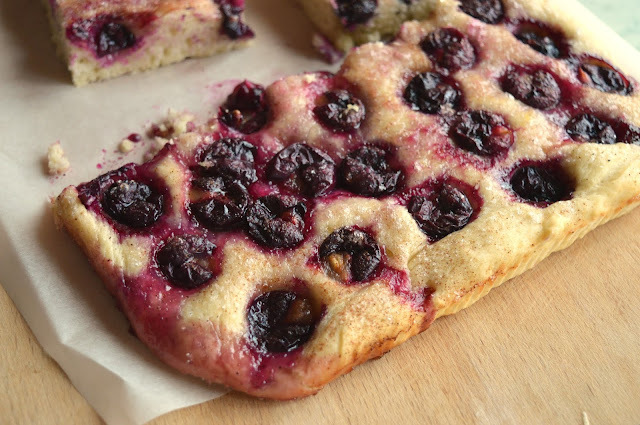 The answer is a Tuscan sweet bread made with grapes, and the name (pronounced skee-ah-cha-ta -- say that five times fast) comes from the verb schiacciare, which means squashed or pressed, referring to the fact that the bread is flat. It is traditionally eaten for breakfast or as a snack in September, when the grapes used to make wine are harvested -- this period is known as la vendemmia -- and as I'm not much of a wine drinker myself, I find this a much better use of grapes (*ducks*). So! My schiacciata saga began with a first innocent attempt using a recipe taken from the blog of a well-known food blogger, one I figured would therefore be a sure, get-it-right-on-the-first-try sort of deal. Surprisingly enough, however, I was disappointed -- although the resulting bread had a nice texture and mostly looked pretty, it tasted of, well, absolutely nothing (the recipe hadn't called for salt or sugar in the dough, which seemed suspect, but what did I know?! I was a schiacciata novice). 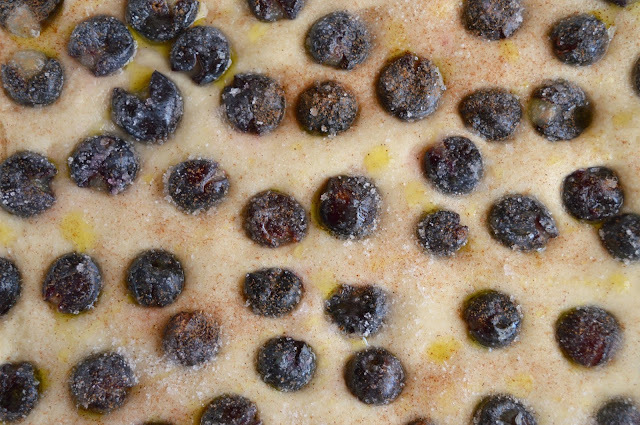 The grapes were not nearly cooked enough, having mostly retained their shape -- the recipe hadn't specified what kind of grape to use, and it turns out I'd used grapes with thick skins and little juice -- and I decided that this was not what schiacciata was supposed to be, not at all. Hmmm. I wasn't at all perturbed by this roadblock -- anzi, my interest was peaked -- and schiacciata con l'uva, at least for a few weeks, became my new obsession. I read about it, comparing recipe upon recipe, and along the way learned that there is no one way to make S.C.L'U. 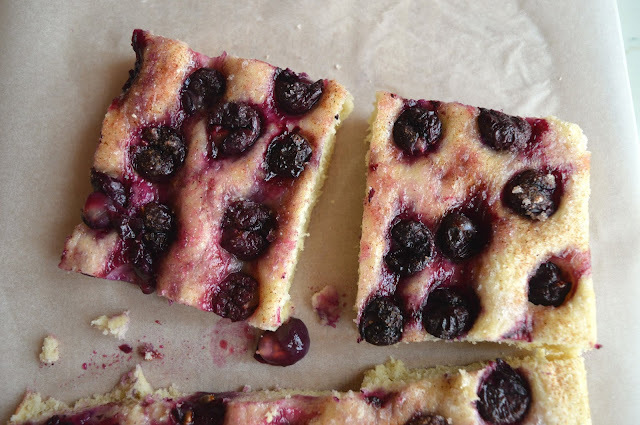 While all the recipes I read resulted in sugar dusted bread topped with grapes, the similarities seemed to end there. 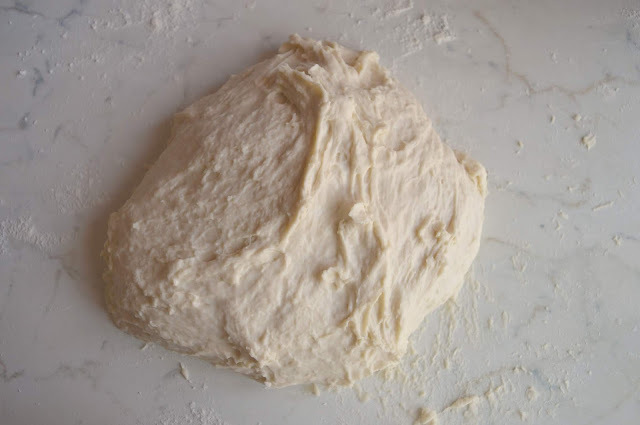 I came across recipes that called for fresh yeast, while others called for dried; some called for multiple rises, others an overnight rise, and still others minimal rise time; some called for salt in the dough, others called for sugar, and one in particular even called for honey and wine in the dough; a few I saw recommended adding rosemary to take the schiacciata in a more savory-sweet direction, while others opted for cinnamon. There were recipes that were so heavy in grapes that the bread was bright purple, and others that used a smaller quantity, with bread peaking out between the grapes. Needless to say, my mind was positively buzzing. In the end -- after a few weeks of trying and tasting various recipes, learning what I liked best in a schiacciata, and ignoring my sister's polite hints that she'd eventually like to eat something other than schiacciata con l'uva -- the best recipe that I tried, the one that made me say "exactly,!" 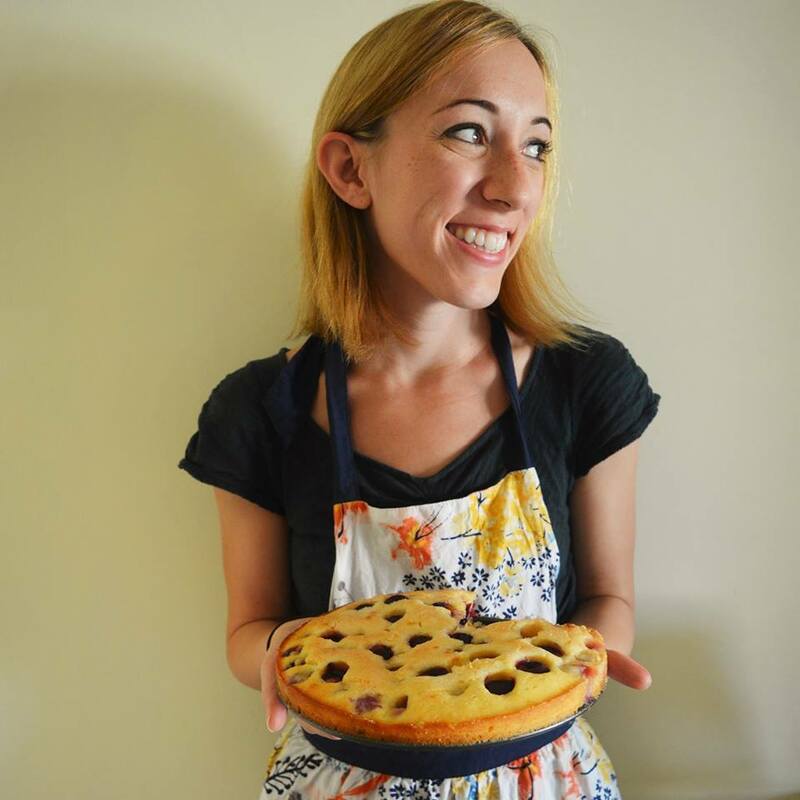 at the first bite, the recipe that made my schiacciata dreams come true, came by way of Carla Tomasi. If you're experiencing a sense of deja vu, that's because Carla has also gotten a mention on here before ( here and most recently here, to be precise). Apart from being a positively delightful person, she is a wealth of knowledge when it comes to cooking, and is responsible for some of the most solidly delicious recipes I've come across the past few month; this one was no exception. 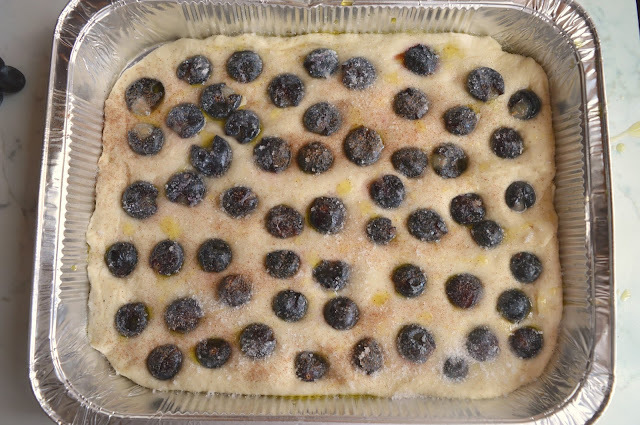 Carla's recipe was one of the least fussy recipes I'd come read -- it required a short rise, and was a one layer deal, unlike most of the recipes I'd seen, which layered the grapes and the dough. It was the lightest and the fluffiest of all the schiacciata that I'd baked previously, not to mention the most flavorful, sweet but not overly so, slightly crisped with sugar, fragrant with toasty cinnamon, and thick with juicy, sweet, slightly caramelized grapes, which delivered the traditional,telltale crunch from their seeds (true schiacciata connoisseurs claim that this crunch is the best part of the whole schiacciata experience). It was perfect, and addictive, so addictive that it even caused the phenomena I'd grown to associate with fudge brownies, or rather, the tendency to repeatedly creep back to the kitchen "just to even out the corner," because, well, symmetry. I loved, loved, loved this, and it brought my schiacciata adventures to a close, in a delicious way. A couple of notes: Ideally, the grapes to be used here are wine grapes, which are small, and juicy (canaiola is one of the more commonly used varieties). 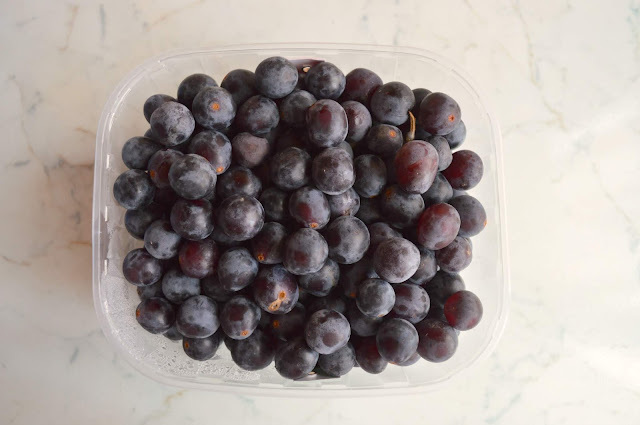 I used uva fragola (for any of you in Rome: I got these at the Testaccio Market) which are a wine grape that work perfectly, but if you don't have access to wine grapes, use the smallest, juiciest grapes you can find. If you're afraid your grapes won't get too juicy in the oven, you can always give them a quick stew on the stove in a little water until they've burst, let them cool, and sprinkle them on (I did this in one of my trial runs with good results). 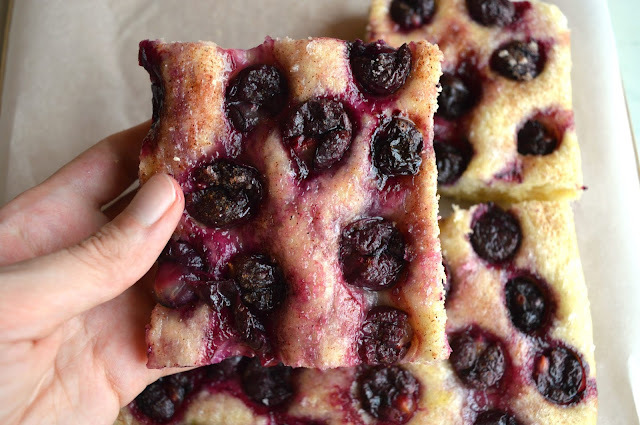 If you don't have any good grapes around and don't want to take the risk, you can also make this schiacciata with figs or plums, or even cherries, blueberries, or blackberries if they're in season, thus taking this in a completely different direction. Lastly, this is best eaten on the day it is baked. 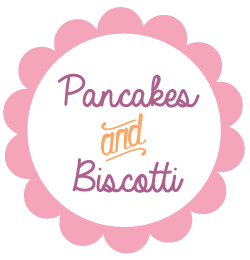 Looking for other homemade bread/pastry recipes? I've got this Challah bread, these Homemade bagels, these Danish fastelavnsboller, these Overnight cinnamon rolls, this Pizza bianca, this Rosemary Focaccia, this Piadina, this Calzone, and these Tigelle. Dissolve the yeast in lukewarm water. Combine the flour, sugar, salt, and olive oil in a bowl pour the yeast mixture in. Stir to combine until a dough forms. 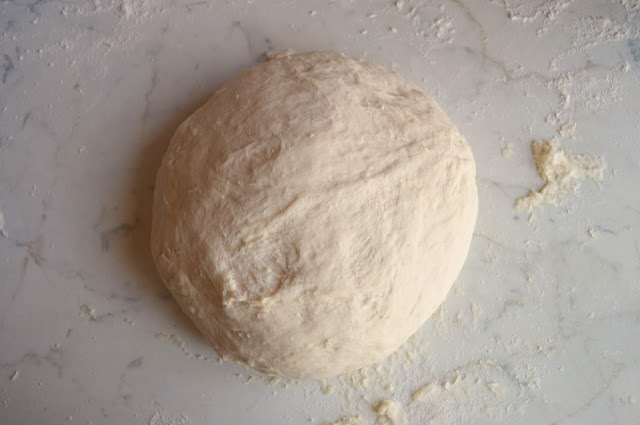 On a clean, lightly floured workplace, knead the dough for about five minutes, or until the dough is shiny and smooth. Form the dough in to a ball and place it in a greased bowl. Using your hand smear a film of olive oil on the top, to keep the dough from drying out. Cover with a tea towel and leave to proof in a warm place for about 2 hours or until doubled in size. Preheat the oven to 450 degrees Fahrenheit (220 degrees Celsius). Grease the bottom of a rectangular pan. 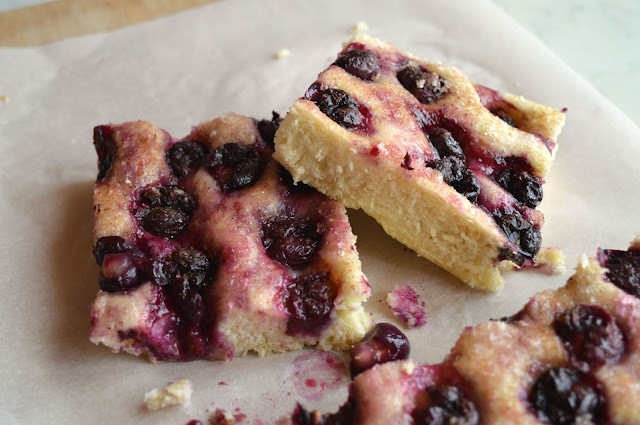 Roll out the dough into a rectangle big enough to fit snugly in to the pan and sprinkle with 3 tablespoons of sugar. Top with enough grapes to cover the surface completely, and press each grape down in to the dough and if you're me, give it a little squish. Sprinkle over the cinnamon and a drizzle of olive oil, plus another two tablespoons of sugar. Bake for 15-20 minutes or until the bread is golden brown and the grapes have almost caramelized. Let cool slightly and then dig in. I'm a firm believer that when your birthday rolls around, you should, as per tradition, eat cake, but not just any cake -- it seems only fitting that when you turn a year older, you eat the perfect cake, the exact cake of your choosing, and if you're not a cake person, then I think you should indulge in any other pie/cookie/pudding/sweet you wish. I care an unreasonable amount about this -- to eat a dessert you feel lukewarm or indifferent about on the day of your birth seems just wrong -- and therefore, when baking for the birthdays of my closest friends, I take extra care to be sure that the dessert is special, exceptional, exactly what they want. As a result I've baked everything from birthday pecan pie bars to mini birthday cheesecakes, birthday brownies to birthday lemon squares, red wine chocolate cakes and carrot cakes and banana cakes, and in short: if you're my friend, and it's your birthday, your (dessert) wish is my command. Last week one of my dearest friends and favorite people, Lavinia L, turned 30, and her Birthday Dessert Quest went a bit like this: she, an Italian, had requested a birthday sweet with chocolate, but as Italians generally keep their desserts simple, was not so keen on the chocolate-y desserts that I proposed to her (butter-and-frosting laden treats like very American Wellesley Fudge Cake and chocolate chunk cookies -- cultural differences, you guys). 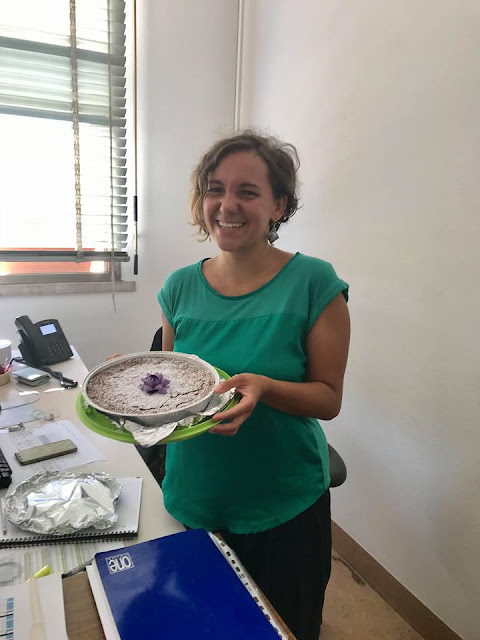 After a bit of brainstorming I suggested this Torta Caprese, a recipe I'd learned during a class with the one-and-only Carla Tomasi, and finally! We'd found our birthday dessert. 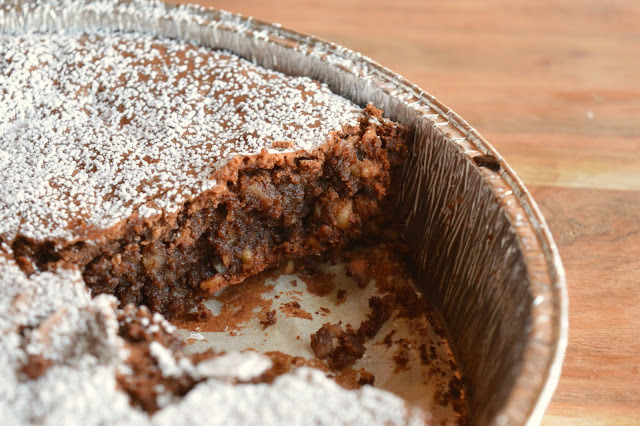 Torta Caprese is a chocolate cake that originates from the island of Capri (hence its name, not to be confused with the more famous insalata caprese). 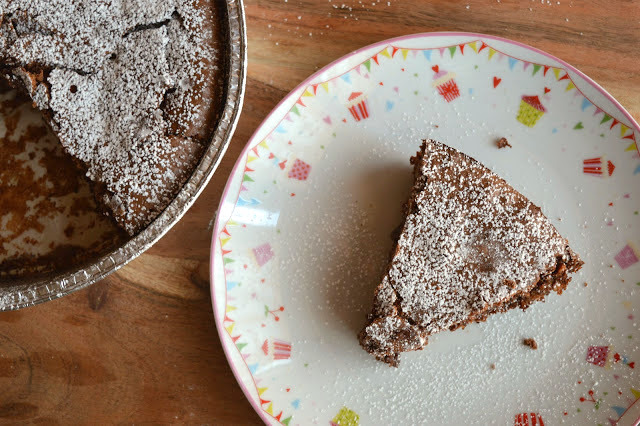 It is one of those rare desserts that gets both the American and Italian stamp of approval, managing to be rich and brownie-like and indulgent and therefore birthday appropriate (check for U.S.A!) but still understated, simple, and not overly sweet (check for Italia!) 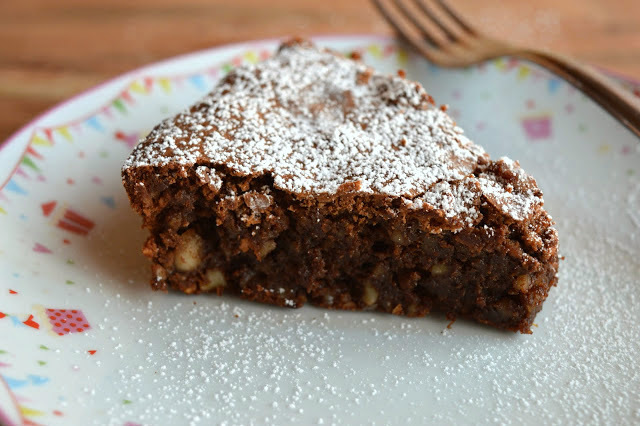 It is intensely chocolate-y, held together by a heap of mild, crunchy almonds, tinged with sunny bright orange, and topped with a shattery, crackly, lid that contrasts nicely with the fudge-y interior -- when dusted with a shower of powdered sugar, there's perhaps no better birthday dessert. Whether or not you choose to add a sparkly bow to the top of the cake (because your BFF doesn't turn 30 every day, after all) is entirely up to you. Birthday mission accomplished, evidence below. A couple of notes: If you don't like orange zest in your desserts, you can always leave it out and add in 1 or so teaspoon of vanilla extract. When processing the almonds, I left a few in bigger pieces (for a little texture) but feel free to process them finer if you want. 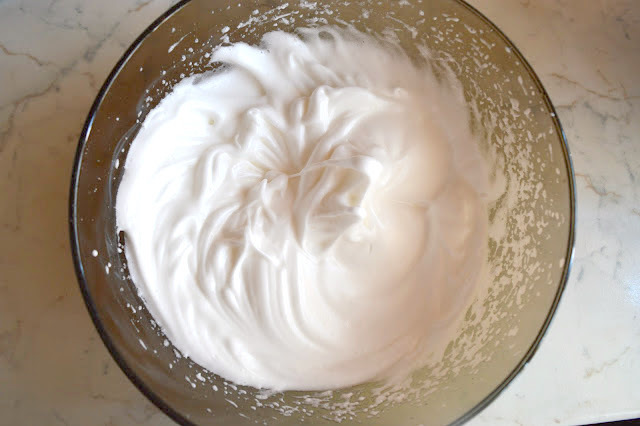 When beating the egg whites, be very sure that the bowl is squeaky clean and that there is no bits of yolk left in there, as this could impede the egg whites from whipping up nicely (I learned this the hard way). Finally, bonus points: this is a gluten free recipe. 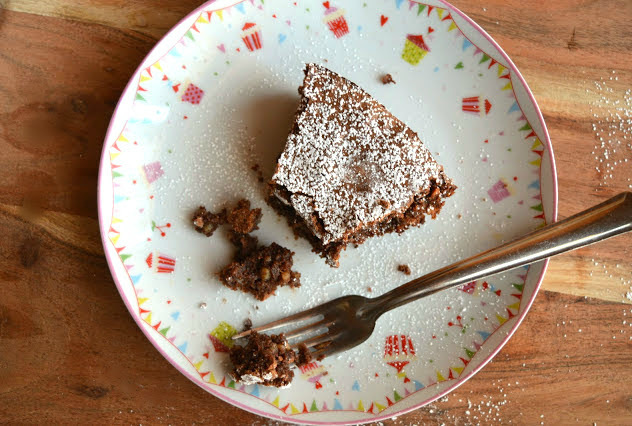 Looking for more chocolate cake recipes? I have this 1940s Wacky Chocolate Cake, this Wellesley Fudge Cake, this Chocolate Fudge Souffle Cake, these Chocolate Lava Cakes, this Chocolate Loaf Cake, and this German Chocolate Cake. 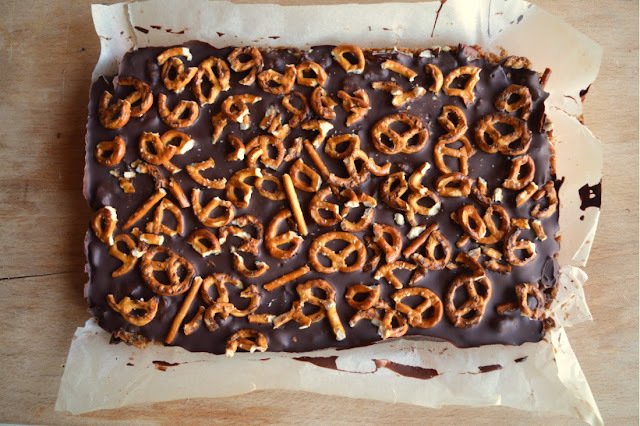 Looking for more chocolate-y recipes? 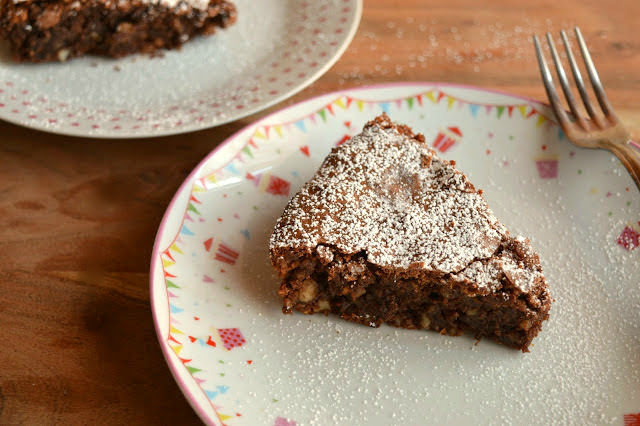 I have these Brownie Cookies, this Brownie Pie, these Fudge Brownies, or this Hot Fudge Sauce, this Pecan Chocolate Pretzel Pie, Cioccolata Calda, and this Chocolate Tart. In a sauce pan over low heat, or using a double-boiler if you prefer, gently melt the butter and then add the chopped chocolate. Stir until smooth and then set aside to cool. Using a food processor, process the almonds until fine, but not too fine -- I like the torta to have a a little texture, so I leave some pieces a little bigger. Set aside. 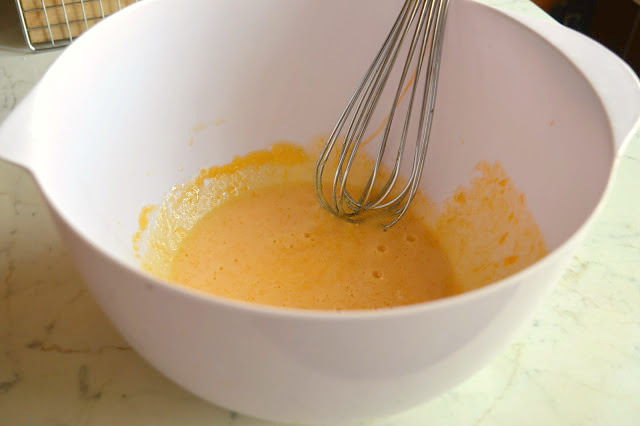 Next, whip up the egg yolks with 80 grams of the sugar and the orange zest. Add the cooled chocolate/butter mixture to the egg yolk mixture and whisk until well combined. Stir in the ground almonds. In a separate bowl, beat the egg whites to soft peaks, adding the remaining 45 grams of sugar slowly as you go. Fold the egg whites in to the chocolate/almond mixture gently, until incorporated completely. Pour the batter in to a 9-inch (20 cm) round cake pan, lined with parchment, and smooth the top over. Bake the torta in a preheated oven (350 degrees Fahrenheit, 180 degrees Celsius) for about 30 minutes -- start checking the cake for doneness after 25 minutes. The cake is done when a toothpick inserted in the middle comes out with no batter attached, just a few moist crumbs. 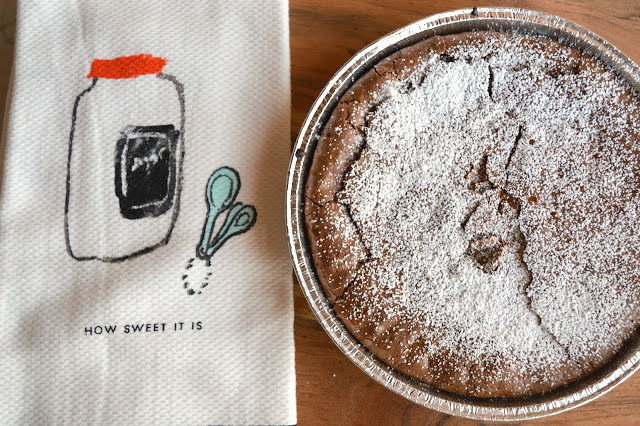 Let the cake cool completely and then serve, dusted with powdered sugar, if you like. Serves 8-10. If you've never made the journey yourself, take my word for it: the 10 hour flight (Rome-Boston home, or Boston-Rome to other home) is not exactly what one would describe as fun. The legroom allotted to your assigned seat is so unreasonable its almost laughable; temperatures in the cabin have two settings, freezing (too much a.c!) or sweltering (not enough a.c! ); a trip to the bathroom becomes an epic challenge requiring you to navigate your fellow cramped, uncomfortable passengers; sleep is nearly impossible; and almost inevitably, you find yourself behind the notorious Recline-Happy-Passenger in front of you who wastes no time in encroaching on you're already minuscule area of space. At this point my sister and I have both made the Rome-Boston-Rome trip so many times that we've learned a few tricks to make the trip a little easier. We take advantage of the airplane WiFi (even if it's decidedly not free! ); we watch anywhere from 3-4 movies from a pretty decent selection; and we bring snacks. Snacks on an airplane, I've found, make everything better, brighter, more bearable, and when coming back from the U.S, we bring a decent stash, most usually peanut butter M&Ms, Triscuits, a few pieces of fruit for balance (snore), and our staple: Flipz. If you're not from the U.S, you won't be familiar with these, but we're talking crunchy mini pretzels coated in milk chocolate and drizzled with white chocolate. They're not the most elegant snack, but they're downright delicious, and nostalgic, too, a treat that made recurring cameos in elementary school lunchboxes and later, during exam time at our college dorm. In short: they're just the sort of thing you can count on to get you through a total 14 hours of travel, and just what you reach for when a R-H-P strikes. But alas! Just a few weeks ago, upon our return to Rome, my sister and I, once settled in to our seats, looked at each other (think the famous scene in the movie Home Alone) and came to a jarring realization: we had left our Flipz at home. I could visualize exactly where they had been left on the kitchen counter, too, and after a moment of shock (a whole plane ride to Rome, no Flipz?!) we got through our trip -- a few packages of sad airplane crackers stepping in -- but both of us swear the hours ticked by a little slower without the presence of the usual bright blue bag of chocolate covered pretzels. But today's recipe! 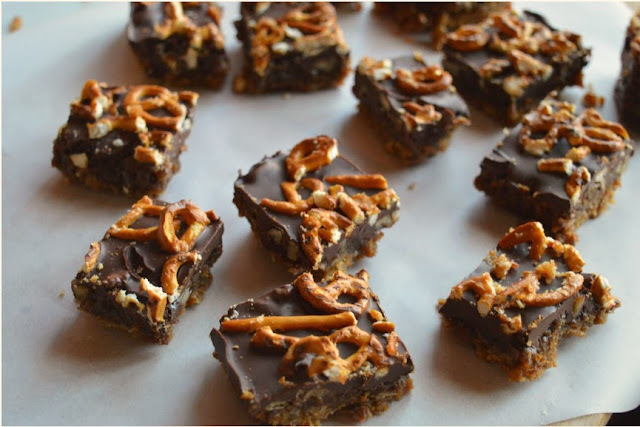 These Chocolate Caramel Pretzel Bars are an ode to our forgotten-at-home Flipz, or rather, Flipz taken to a completely new level, an edible apology to my sister (apparently I was in charge of the snacks -- I refuse to comment at this time). 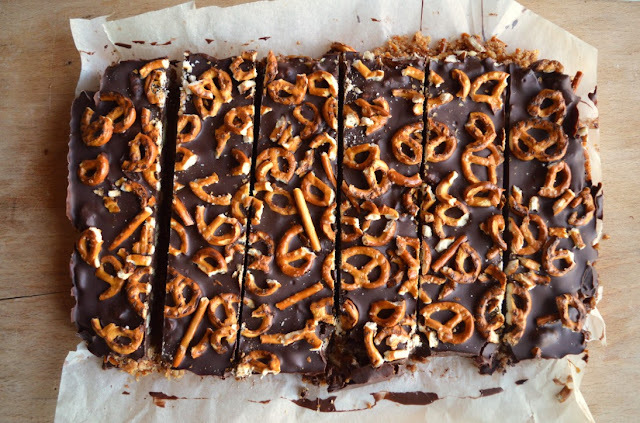 As the title suggests, these bars are not for the faint of heart -- here we've got a tantalizing mix of crunchy, salty pretzels, toasty, buttery caramel, crisp pecans, and a good layer of bittersweet chocolate. They mix salty with sweet and are therefore inevitably addictive, magical, and in fact they disappeared in no time in the presence of my hungry sweet-toothed colleagues. In short: I think a batch of these could make a 10 hour flight seem like 10 minutes, they're that good. 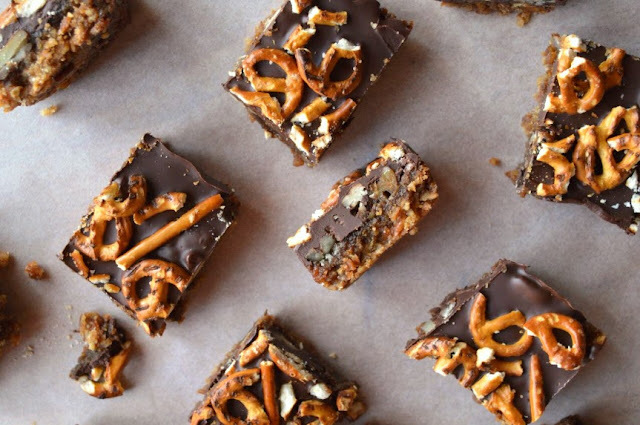 Make these and you won't be sorry. A couple of notes: The recipe as written in the NYT says to use a 9 inch square pan, which I guess would make for bars with a really thick pretzel crust. I opted for an 11x7 inch rectangular pan and that worked just fine, though with a slightly thinner crust. Since I used a rectangular pan, I melted a bit more chocolate (maybe another 100 grams?) to make sure I would cover the whole top of the crust. The pretzels on these become a little less crunchy and a little more chewy the day after baking, so try and eat them the day of. Finally, if you don't have a food processor (I don't, at the moment) feel free to do what I did, which is place your pretzels in a freezer sized bag placed in another freezer sized bag, and crush them with a rolling pin. It takes a little more elbow grease but is just as effective. 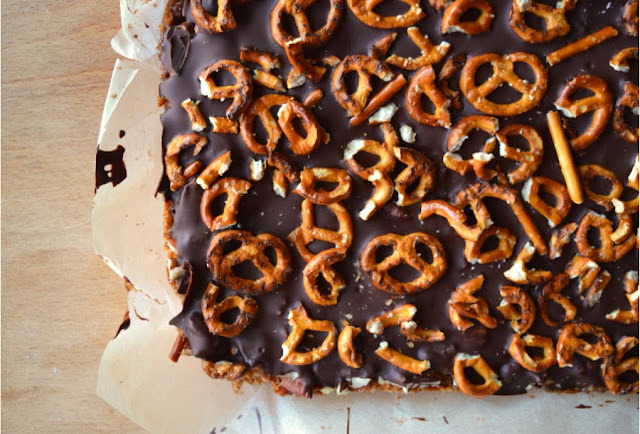 Looking for other desserts that use pretzels? It just so happens that I've got this Pretzel Chocolate Pecan Pie. Looking for other bar desserts? 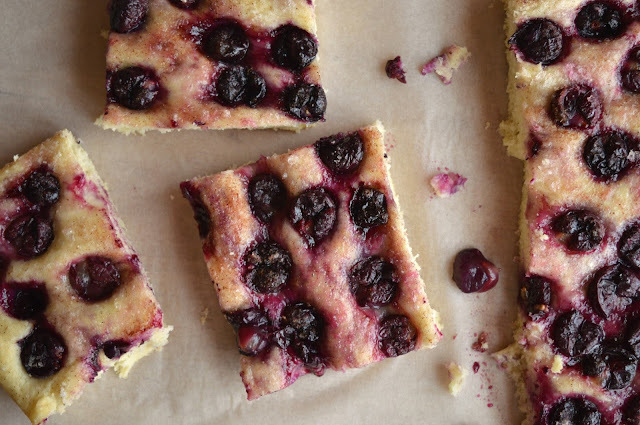 I've got this Blueberry Pie Bars, these Fudge Brownies, these Blondies, these Coffee Chocolate Chip Blondies, these Dulce de leche Brownies, these Dark Chocolate Gingerbread Bars, and these Lemon Squares. Preheat the oven to 350 degrees. 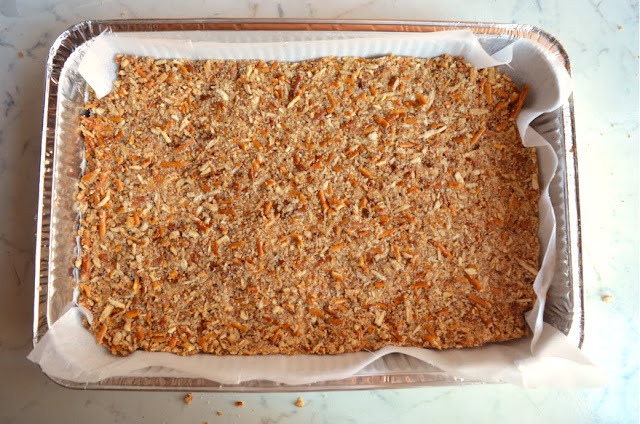 Line a 9-inch square baking pan (or a 11x7 inch rectangular pan, if you're me) with parchment paper leaving a leaving 2-inch overhang on two sides. 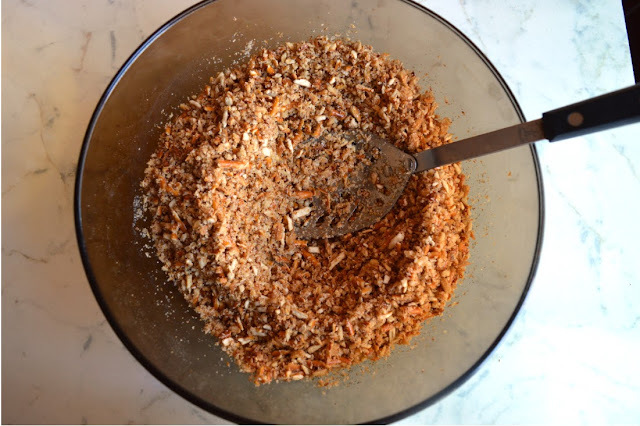 In the bowl of a food processor, combine pretzels and sugar and process until you have fine crumbs. Add melted butter and process until evenly moistened. Transfer mixture into a prepared pan and press down into a compact even layer. Bake until the crust is fragrant and edges are browned, about 17 minutes. Sprinkle with pecans and set aside. Time for the caramel! In a medium saucepan, combine butter, cream, brown sugar, and salt. Heat the mixture over medium heat, stirring, until the butter melts and everything is well combined. Turn the heat to medium-high and bring to a simmer. Cook for two minutes. 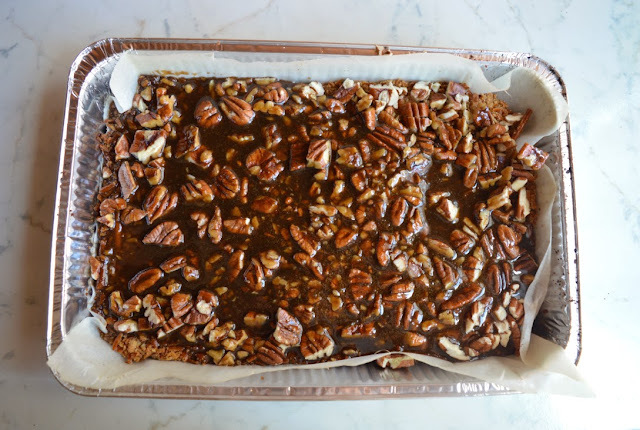 Pour over pecans and prepared crust. Bake until caramel is bubbling and has darkened slightly, 13-15 minutes. Transfer to a rack. While the caramel cools slightly, melt chocolate in short bursts in a heatproof bowl in a microwave or using a double boiler. 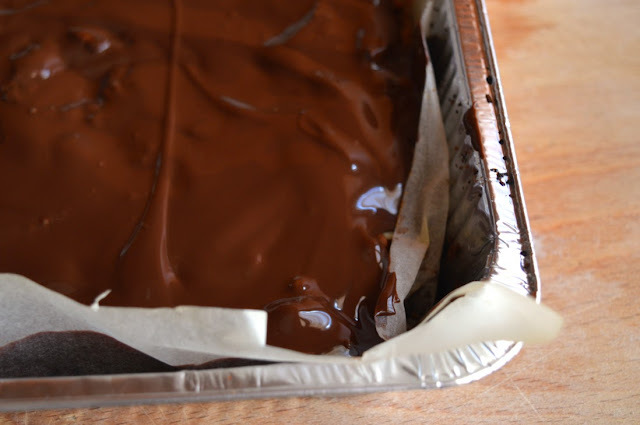 Let chocolate cool for a few minutes, then spread evenly over the caramel. 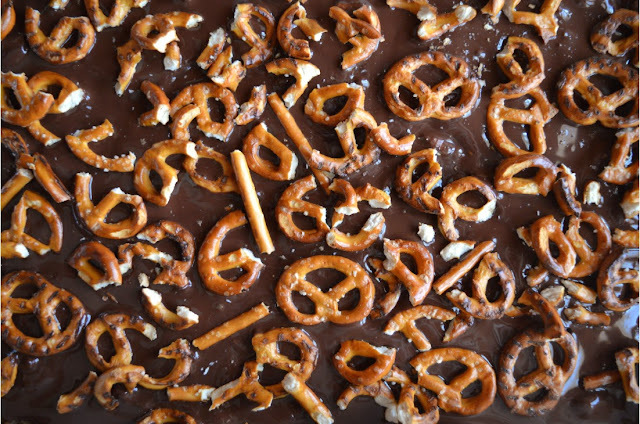 Sprinkle with crushed pretzels and let cool to room temperature. Transfer to the refrigerator to set for 30-60 minutes. To serve, lift the bars out using the parchment overhang and transfer to a cutting board. Cut into 16-20 squares. Store in an airtight container in the refrigerator. When it comes to seasons, I think we can all pretty much agree on Winter (cold! dark!) and Spring (warmer! the end of Winter!) but are often divided on Summer and Fall. If your allegiance stands with summer, you most likely flourish in the heat and the warmer, longer, sunshine-filled days, spend lots of time at the sea, and look forward to the arrival of Burger and Ice Cream and Lemonade Season. If you're on Team Fall, on the other hand, you probably welcome a little frost, the changing colors of the leaves, and sweaters and scarves and pumpkin-everything. I myself stand firmly in the Summer camp; I mourn the end of my Very Favorite Season, and September 1st (while not the official end of summer) is one of the most unanticipated days of the year for me (second only to the day after Christmas, My Favorite Holiday). I adore June, July, and August, love cooking with all that's in season, pride myself on my vast sundress collection, and positively relish leaving work at 5:00 and finding that the sun is still shining and that there are aperitivi all'aperto to be had with friends. I always feel a little crestfallen when I (inevitably) feel the first autumnal chill in the air, and here in Rome, Fall seems to be most certainly on its way. The metro in the morning is packed again; evenings have become decidedly cooler; I've even worn jeans to work already (sigh). Having said all that, summer doesn't technically end until September 21st, and therefore for the next 18 days, I will very much carry on as if Fall has decided to surprise us all and take the year off. Today's Fried Eggplant, Tomato, and Peach Salad -- which comes from Food52 writer Emily Connor -- is a dish that allows me to pretend that my least favorite season is not right around the corner; my market still has some very good tomatoes, lots of basil, a last lingering decent peach or two, and lots of in-its-prime-eggplant. The finished dish is, as the cookbook it comes from proclaims, mighty, a glorious mix of different textures, flavors, and temperatures. 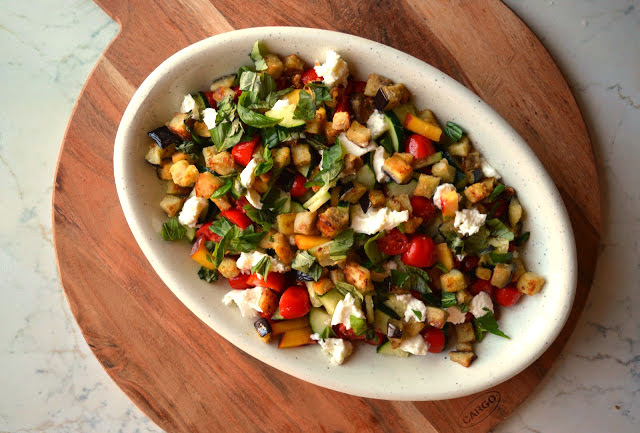 We've got a good dose of juicy sweet tomatoes and peaches, crisp refreshing cucumber, plus dreamy mozzarella di bufala and the star of the show, cubes of crispy, golden brown eggplant, made downright addictive with a good sprinkle of salt (think french fry). The whole thing is tied together with a splash of sunshine-y lemon vinaigrette and a sprinkle of I-make-everything-better basil, and all together, it was a symphony of a dinner, and one where you feel vaguely healthy (fruit, veg!) but still satisfied (cheese! fried food!) And re: the fried eggplant, well, let's face it, the recent sneak preview of Fall did make frying both possible and bearable, I admit it. One (begrudgingly) won point for Fall! A couple of notes: In hindsight, I wish I had cut the eggplant in to larger pieces (like I said, it was the star for me). I kept them on the smaller side, but when I make this again I'll stick to Emily's advise of 3/4 inch pieces. The cornstarch/flour mixture ensures a nice crispiness to your eggplant; if you have it, Wondra flour can also be used. If you can't find preserved lemon (which can be found at specialty food stores here) you can always mix olive oil, lemon juice, and lemon zest to taste with a little salt and pepper to achieve a lemon-y dressing nonetheless. Finally, a nectarine would be a good substitute for the peach if you'd like, and if you'd prefer, burrata instead of the mozzarella di bufala. Looking for other eggplant (aka melanzane) recipes? I've got this Parmigiana di melanzane, these polpette di melanzane, this Sicilian eggplant caponata, this pasta with swordfish, eggplant, and tomatoes, and this rigatoni with eggplant, mozzarella, and tomatoes. In a small bowl, whisk together all of the vinaigrette ingredients and set aside. Dust the eggplant cubes with the cornstarch and flour mixture (I used a heaping 1 tablespoon of each) in a large bowl. In a large skillet, warm the vegetable oil over medium-high heat and fry the eggplant in a single layer, cooking and turning until brown and tender, about 3-5 minutes. When the eggplant is fried, lay it on a paper towel lined plate to drain, and repeat as needed. Season with salt. 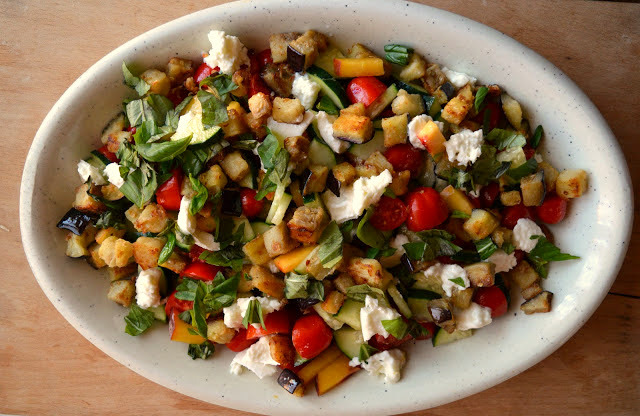 In a large bowl, toss together the cucumbers, peach, tomatoes, and half the vinaigrette. Toss to combine and let sit for a couple of minutes. 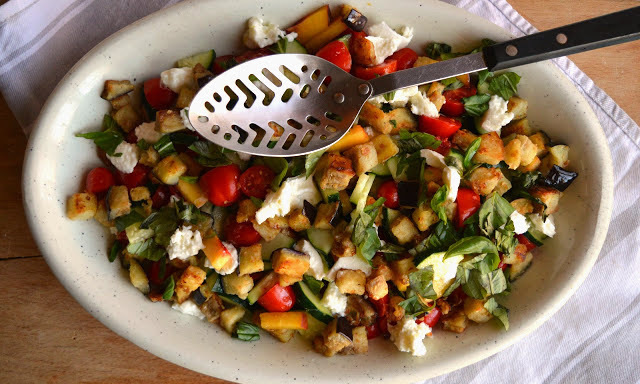 Arrange the salad on a large serving platter, then scatter the eggplant, mozzarella, and basil over the top. Drizzle the rest of the vinaigrette over, sprinkle with salt and a few grinds of salt and pepper, and eat immediately.